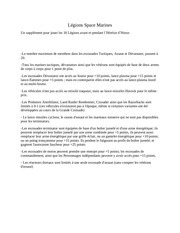 Ce document au format PDF 1.3 a été généré par QuarkXPress(tm) 6.5, et a été envoyé sur fichier-pdf.fr le 16/01/2010 à 12:42, depuis l'adresse IP 74.15.x.x. 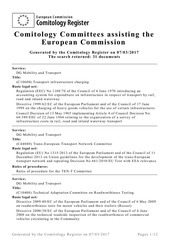 La présente page de téléchargement du fichier a été vue 3319 fois. 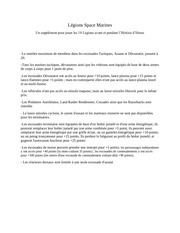 Taille du document: 335 Ko (16 pages). of rules for each vehicle, regardless of which game you are playing. squad (without jump packs), Devastator squad. The Predator Destructor is a Heavy Support choice for a Space Marine army. The Predator Annihilator is a Heavy Support choice for a Space Marine army. The Baal Predator is a Heavy Support choice for a Blood Angels Space Marine army. Captain and Command squad, Tactical squad, Sternguard Veteran squad, Vanguard Veteran squad (without jump packs), Devastator squad. The Whirlwind is a Heavy Support choice for a Space Marine army. The Whirlwind Hyperios is a Heavy Support choice for a Space Marine army. The Vindicator is a Heavy Support choice for a Space Marine army. see if an enemy unit is hit by a preliminary bombardment. teleporting troops may re-roll the Scatter and Distance dice. 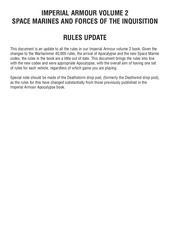 Warhammer 40,000 battles the rules are as follows. The Damocles Rhino is a HQ choice for a Space Marine army. The Land Raider is a Heavy Support choice for a Space Marine army. The Land Raider Crusader is a Heavy Support choice for a Space Marine army. The Land Raider Helios is a Heavy Support for a Space Marine army. A Land Speeder Squadron is a Fast Attack choice for a Space Marine army. The Land Speeder Storm is a Fast Attack choice for a Space Marine army. • May select a Drop Pod. A Venerable Dreadnought is an Elites choice for a Space Marine army. A Dreadnought is an Elites choice for a Space Marine army. A Furioso Dreadnought is an Elites choice for a Blood Angels Space Marine army. A Mortis Dreadnought is an Elites choice for a Dark Angels Space Marine army (or any Dark Angel’s successor chapter). A drop pod is a dedicated transport choice for a Space Marine army. assault cannon attacks against each target unit. weapon, picking a enemy target and resolving the firing as normal. A Deathstorm drop pod is a Heavy Support choice for a Space Marine army. assault on the same turn). 1-3 Thunderhawk Gunships are a war machine detachment for a Space Marine army. remains in that mode for the rest of the game. are within a fixed 90º arc. 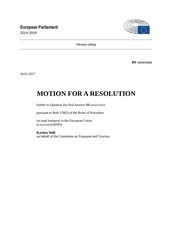 ignored, immobilised vehicles will still continue to be targeted. A Sentry Gun battery is a Heavy Support choice for a Space Marine army. These guns do not have to be deployed together. more than one platform then each platform will fire a single missile. The platform mounted Hyperios can only be fired at aircraft, it cannot engage ground targets. A Hyperios air defence battery is a single Heavy Support choice for a Space Marine army. All platforms must deploy within 36” of the command platform. The Land Raider is a transport choice for an Inquisitor and his retinue. The Land Raider Prometheus is a transport choice for an Inquisitor and his retinue. The Rhino is a dedicated transport vehicle for an Inquisitor and his retinue or Inqusitorial Storm Troopers. 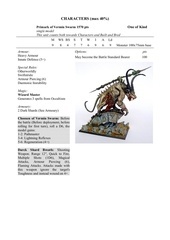 The Chimera is a dedicated transport choice for an Inquisitor and his retinue or Inqusitorial Storm Troopers. Cyclops or Tarantula sentry gun. cannot take Hellstrike missiles or rocket pods. An Inquisitor Valkyrie is a Transport option for an Inquisitor and his retinue or Inquisitorial Storm Troopers. The Grey Knights Land Raider is a Heavy Support choice for a Daemon Hunters army. The Grey Knights Land Raider Crusader is a Heavy Support choice for a Daemon Hunters army. 1-3 Thunderhawk Gunships are a war machine detachment for a Daemon Hunters army. A Grey Knight Dreadnought is a Heavy Support choice for a Daemon Hunters army..
Adeptus Sororitas Heroine and retinue. 12” and still fire its twin heavy flamers. squad, Celestian squad, Dominion squad, Adeptus Sororitas Heroine and retinue squad. how many missiles are launched. Roll to hit as normal for each missile. A Exorcist is a Heavy choice for a Witch hunters army. Retributors squad, Adeptus Sororitas Heroine and retinue. It may be taken as a dedicated transport vehicle for Inquisitorial Storm Troopers or Adeptus Arbites squads. Ce fichier a été mis en ligne par un utilisateur du site. Identifiant unique du document: 00014423.